Another superb recording, their best yet, from this West Coast vintage swing sextet. The presence of vocals, ukulele, Hawaiian Steel guitar, and a two-man horn section give this group a uniquely fresh take on traditional American jazz and swing. 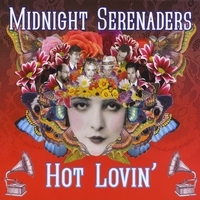 The Serenaders have released their third album, “Hot Lovin,” after their first two albums “Magnolia” (2007) and “Sweet Nothin’s” (2009) were release to critical acclaim. The Portland Tribune declared that their first album “revived lost classics from the vintage jazz era while keeping the inherent giddiness of that time perfectly intact,” and Portland Monthly says of their second album: “Plenty of bands attempt to recapture the jive sounds of the Roaring Twenties, but most of them just sound, well, jive. Midnight Serenaders...sashay from torch song to hot jazz with panache and a genuine respect for yesterday s hit parade.” Their new album features some new originals by Settlemier and ups the ante with the presence of several special guests with notable Portland jazz pianist/composer Andrew Oliver on piano and on accordion Eric Stern, leader of the popular Eastern European cabaret act Vagabond Opera. The Midnight Serenaders continue to swing along in the modern age, helping to ensure that the joyous swing of one of America’s most original art forms will never be forgotten. A perfect blend of jazz that I have been listening to in the office, while cooking and while commuting. I think it would make a great dinner party music too. A really excellent cd by the band and their best to date . Great packaging too and Henry's steel playing is great as always ! I play this CD in the car a lot and it is always an upbeat, uplifting listen. My favorite song is "I'm Playing In Your Parlour Game", and the horn work on "Junk Man" and the classic "It Don't Mean A Thing" are first rate. The Chantuse continues to entertain at the top of her game.